The Zoo Negara, once set in virgin jungle, now stands like an oasis amidst a concrete jungle. It was officially opened to the public in 1963. The zoo features about 400 species of Malaysian and exotic mammals, reptiles and birds. Of these, the majority are fish and bird species while about a hundred are mammals and the reptiles. The National Zoo is situated 13 km from the centre of Kuala Lumpur. Its aquarium "Tunku Abdul Rahman Aquarium" is a very popular attraction. It displays over 80 species of aquatic animals, both marine and freshwater, including invertebrates. In the Zoo are numerous paths meandering between wooded groves and tree-lined enclaves where the animal enclosures are located. Among the more exotic exhibits are the Sumatran tiger, orang-utans and gibbons. All are extremely rare outside this part of the world. There are also scheduled elephant shows in the elephant Amphitheatre and a "Multi-animal show in the "Main Amphitheatre". There's also a possibility make a ride on an elephant. You can take a taxi or go by the Putra Line. The last one departs every half an hour. We have decided to go to the main attraction of the Zoo: the elephant show! Twice a day there is a show, but there are some more shows. 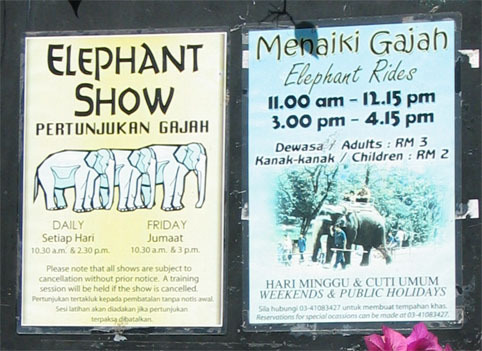 Near the gate is a bulletin board with a poster, which tells us, that the elephant show starts at 10.30 and at 14.30 in the elephant Amphitheatre. There's another poster with the times of the Multi- animal show. We can enjoy that one in the "Main Amphithatre". Visitors are asked not to feed the animals. They do that by funny board: a hand with a banana and an elephant. And a big cross right through it. Many animal are adopted by a company. The tiger is sponsored by Esso (!). A clever way of doing advertising, because your company name is on a board near the cage. Everybody can read this. Sponsoring to keep the cost low! Visitors of the Zoo behave respectful towards the animals. You don't see them feed the animals. The elephants are the pride of the zoo. What we can't make in our zoo's, they can do in the Far East. Even in the Zoo Negara you can make a ride on an elephant (RM3,-). They wouldn't approve that in my country. Normally the elephant training for the zoo is restricted to a practical training. These elephants must additionally learn some tricks that are to be shown in the program later on. There are good and impressive elephant numbers, which enable the animals to show their strength and swiftness or rather their sensitivity. But there are also many bad acts, which force the elephants to show exercises absolutely unnatural for elephants. elephant the first respect for its keeper. he must stroke it. Stroking is important. itself touch from head to foot. are "Yes";, "No"; and "Good". The African lion has found a place in the shade. Later on he jumps on the platform and gives a very big roar. He's the king of the jungle. The Lion Group has adopted this African lion at Zoo Negara under a sponsorship programme costing RM17,000 per annum which covers feeding, medication and maintenance of the lion. Many of Malaysia's most endangered species have found a home in the Zoo Negara. There are only 600-1000 sun bears left in Burma, Thailand , Sumatra and Malaysia. It is the most endangered of the and the smallest bear species and not much studied. Habitat loss, forest fragmentation and hunting have decimated its numbers.